An estimated 5.5 million Americans live with Alzheimer's disease, a type of dementia that causes problems with memory, thinking and behavior. Although treatments can slow the worsening of symptoms, scientists are still working to better understand the neurodegenerative disease so that curative and preventative medicines can be developed. A new imaging system could help speed new drug development by offering a better way to monitor the brain changes indicative of Alzheimer's in mouse models of the disease. Mice genetically modified to exhibit characteristics of Alzheimer's disease are a valuable tool for studying the disease's biology and testing new drugs. Like people with the disease, the brains of these mice accumulate clumps of proteins known as senile plaques. 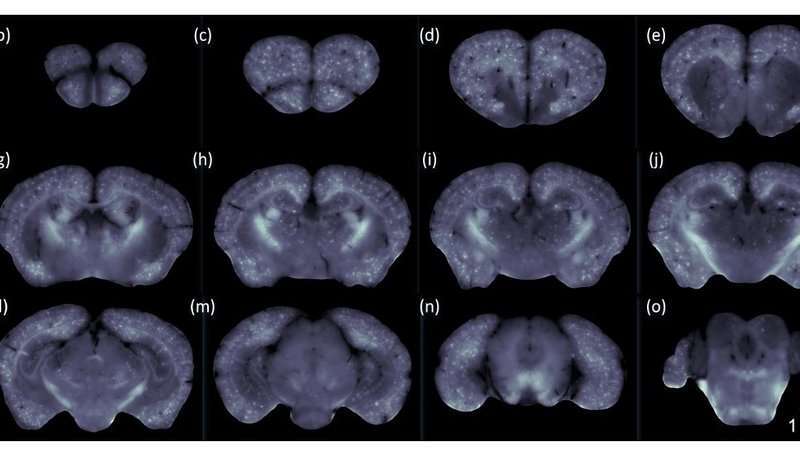 Qingming Luo's Visible Brain-wide Networks team at the Huazhong University of Science and Technology, China developed a system called cryo-micro-optical sectioning tomography (cryo-MOST) that improves the ability to image these senile plaques in the whole mouse brain. "Studying the brain-wide distribution of senile plaques in mice will facilitate an understanding of how brain functions deteriorate during Alzheimer's disease progression," said Jing Yuan, a key member of the research team. "We hope that cryo-MOST will accelerate the development and evaluation of Alzheimer's disease treatments." 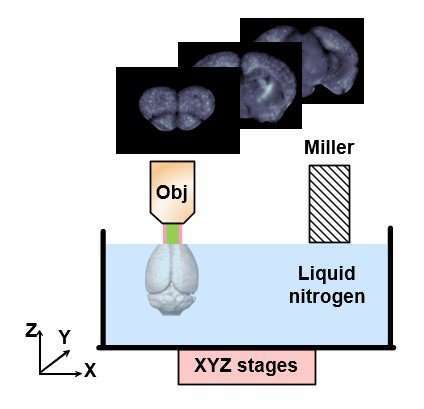 In The Optical Society (OSA) journal Optics Letters, the researchers detail their cryo-MOST system and report results from using it to create 3D, micron-resolution maps of senile plaques throughout the brain of a mouse model of Alzheimer's disease. The new system is simple and efficient compared with conventional approaches, requires no external dyes or labels, and because it is optical, offers more detailed information than other imaging techniques such as magnetic resonance imaging (MRI) or Positron Emission Tomography (PET). "Exogenous dyes may lead to unspecific, false-positive or uneven labeling in brain tissue, which impedes observation of authentic pathological structure changes of Alzheimer's disease," said Yuan. "Our label-free approach avoids these problems while also simplifying the sample preparation, thus accelerating the research process." To demonstrate the ability of cryo-MOST to image the brain-wide distribution of senile plaques, the researchers used it to image a whole brain from a 17-month APP/PS1 mouse model of Alzheimer's disease. "The images from an aged Alzheimer's disease mouse revealed that senile plaques have spread to the whole brain," said Yuan. "This indicates that the disease not only hurts memory and intelligence, but may also cause an overall deterioration of other brain functions." The research team is currently working to improve the automation of the approach to speed up image acquisition and is incorporating enhancements that will improve image quality. These upgrades will allow their approach to be used for more applications. They are also continuing to use cryo-MOST to study senile plaque distribution and morphology changes that come with the progression of Alzheimer's disease. "In addition to evaluating drug efficacy for neurodegenerative diseases, we believe our method will help neuroscientists understand the relationship between senile plaque distribution and other key factors of Alzheimer's disease," said Yuan. "This will enhance the comprehensive understanding of the disease mechanisms and treatment."